The first thing you notice when you drop down in Anchorage, Alaska, on a late, late weeknight in June is the light. It’s otherworldly, and it immediately works on your senses. Though you left San Francisco hours ago and know you should be tired, you find yourself wide-awake and bright-eyed at well after midnight. The sun is balmy on your skin and the air is still as warm as a summer afternoon, yet somehow, despite your travel exhaustion, you wake right up. June is the season of the long-lit summer equinox in Alaska, when the Earth is tilted just so, and the sun never really leaves the sky. The light is with you all day long and almost all of the night, and though that sounds straightforward enough when it’s spelled out in words, the feeling of it is like a mysterious, exhilarating elixir you can’t quite figure out the nature of, or how it works on you. But it does work on you. It is a sensibility we in the “lower 48”—a term you’ll hear from Alaskans the moment you disembark from the plane—have no real sense of: Light, all by itself, can invent an adventure culture. Natives call Alaska “The Last Frontier” for reason. All you have to do is look around. The earth is different. Sharp peaks, snow-covered and icily dramatic, surround you in circles like kings and queens in royal garb. The sky is huge and high, with wispy-looking clouds strafing the skyline. The colors that greet your eyes are white-whites and delicate pinks and the vibrant orange of the orb of the sun burning across the horizon and rounding itself back again. Iridescent green-greens cover all of the ground-born landscapes. It’s a green you can feel vibrating in your heart and mind—a hue that makes you astounded the land is covered under snowfall for more than half the year. There is drama everywhere you look in Alaska’s landscape, in its very geography. And the point—so emphatically obvious—is to get out into it. Surely many visitors love the cruise line experience of viewing Alaska’s ice walls from the sea and wandering the small inlet towns along the coast at port. But hiking—or in its more accurate description, trekking—is the very best way to touch, feel, and sense Alaska’s great natural landscape. Nothing is close-by—land is vast in the state—so if you’re heading out for an adventure, you’ll surely need a rental car. Once you’re gassed up and ready to go, here are some amazing hikes and sights to fulfil your soul’s longing for exquisite exploration. 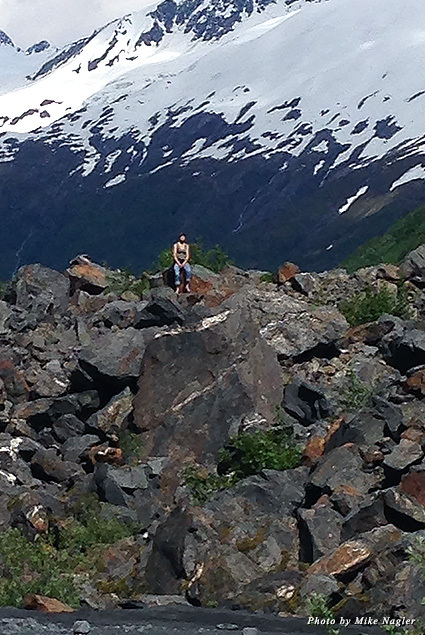 Take a simple drive south on the highway that also leads toward the little town of Seward, make a left turn off the main road toward the tiny village of Girdwood, and then head toward Byron and Portage glaciers. Park at the State Park entrance for Byron, lace up your boots, and head out for an easy but soul altering, dramatic hike. The path is a simple 15-minute trek to the first viewing spot, and depending on the time of year there may still be ice caves at the glacier’s base. When we arrived, the caves had melted, leaving first a snowfield and then a boulder field to cross (somewhat challenging hand-to-feet climbing), which once traversed left us directly below Byron Glacier in a small creek-filled valley. The first thing you learn about glaciers in Alaska is the difference between frozen water—which is ice and has a white hue–and glacier water. 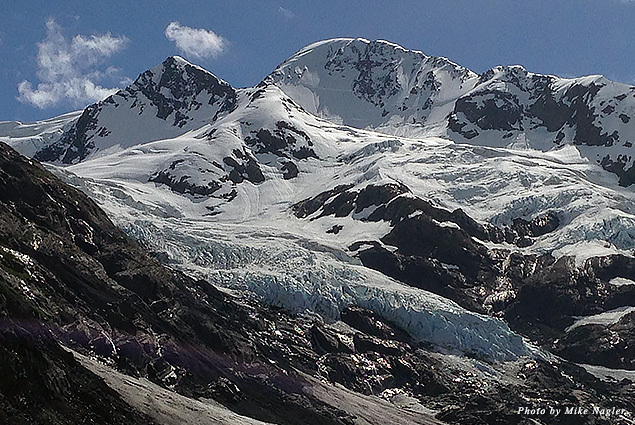 Glaciers are an icy light blue in color tone, and tend to fill the crevasses between great mountains in sheets. It’s a telltale sign: packed snow upon the top of an iridescent turquoise blue ice wall. There are no real words for the tranquility of standing at the base of a glacier. It is simple serenity to stand and view it, certainly, but there’s something spiritual about its form and its effect. Its hugeness surely is a part of that, and our relative smallness in relation to it—but the feeling is like looking into the formation of life itself. That gives one absolute pause, and it certainly leaves the soul awash in humility before the hugeness of its grace. 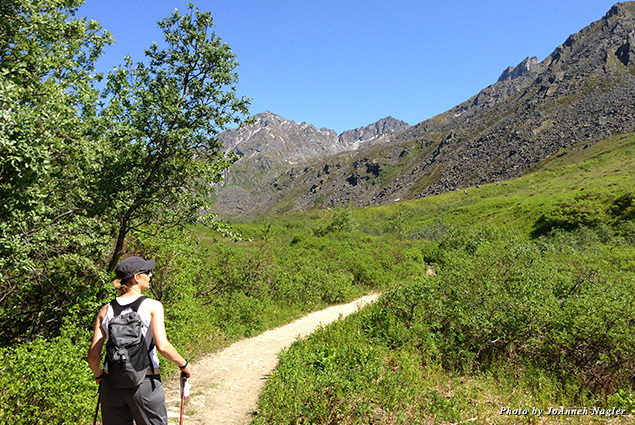 Artic Lake’s trailhead is just a 30-minute drive from Anchorage up a winding road. The hike is a vigorous three- to four-hour trek up, windy and steeply inclined, and begins just at the base of the winter ski lodge. The landscape is mostly open with sweeping views down the valley and across the steep slopes. 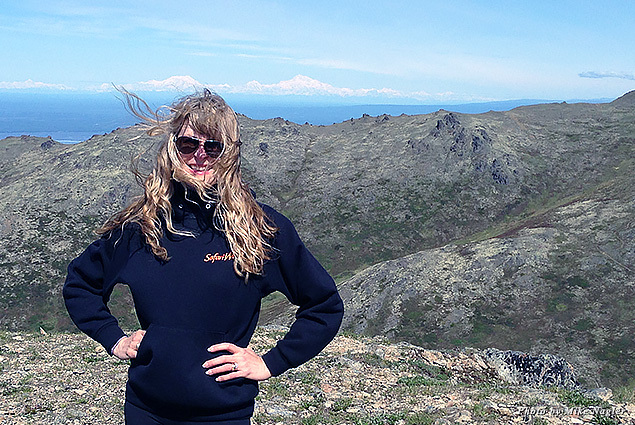 On the day we trekked it, it was windswept and clear, and at its peak we were able to see straight across the 200-mile valley for a beautiful view of Denali. Mount McKinley is often shrouded in clouds, so to view it on a clear day from any direction is a special blessing. Looking down, we saw snow melt turning rapidly into rivulets under the sun’s eye, and valleys lush with greenery. Water is everywhere, and for Californians deep in the midst of a drought, the sensation of ample, pure water in each corner of our sightlines was lush and fulfilling. In the continental states, we tend to think of mountain peaks as single, prominent events rising from the earth—think Mount Shasta or Mount St. Helen—but not so in Alaska. Here the peaks are rising in company with each other, whole ranges popping up out of flat land and scraping the sky. The clouds strafe the blue atmosphere in streaks, and the air is so crisp it makes you want to drink in every bit of its cleanly infused oxygen. Lakes gather at the base of peaks, and ice floats and melts in discs of green-and-turquoise-infused color. The trek up can be windy, and the air blowing fiercely across the face only adds to the mystique of its prominence. Standing on a peak and looking straight down the sheer and rounded mountaintops, you can see the whole vast carving-out of what glaciers did to the place thousands or millions of years ago. 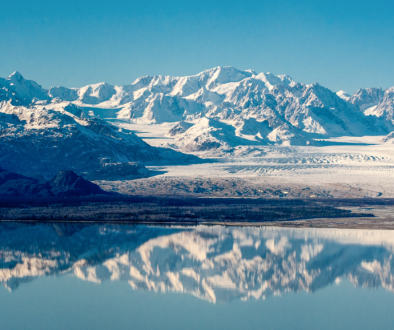 Arctic Lake is the place to see mountain ranges in their full nobility and grace, and if you’re lucky, on a perfect day, to get a glimpse of Denali. It’s an amazing viewing spot for the state’s exceptional natural magnanimity. 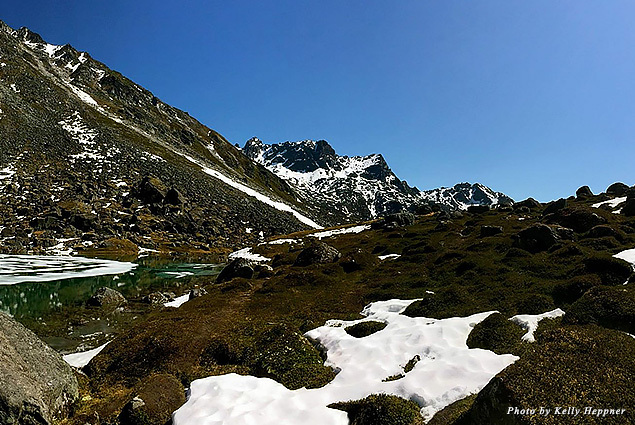 Hatcher Pass, just outside of Anchorage, is one of the most spectacular trekking paths in America—and that’s not an exaggeration. The day we trekked it we hiked 15 miles round trip—a total of eight hours ascending up from 1,500 feet to 4,000 feet. Hikers can take the trail as far as they like. There’s no need to trek as far up as we did if you choose not to, and there are beautiful sites to be seen all along the way from the moment you hit the trailhead. But the incentive for making a day of it, for hiking all the way up into the high country, is to see Reed Lake—a glacier-fed, iridescent, green body of chilly water filled with floating ice—and then to ascend above it to the dramatic waterfalls that feed it. The trailhead begins among wildflowers and cold, freshly running streams. The mountains surround you, snowcapped and rocky, and look as if they’re piercing the royal blue of the sky. Once you begin to climb, the sky seems to get even bluer than its already luminescent hue, and glacier water produces little swimming holes that invite you to dip your feet. The water’s truly freezing—some of the iciest I’ve known—yet, still somehow inviting. It’s a chill that brightens the body, even while it’s freezing it. I got only halfway up to my thighs in the water—my best attempt—and it truly was like sinking one’s body into a subterranean, instant-freeze ice bath. The mountains cascade up, much like in the Rockies, and as you traverse up the sides of peaks, you will often reach what’s called a “false summit”—that is, what appears to be the top of the mountain but, once attained, morphs into a rock field, a stony terrain, or even another bit of a steep, scree-filled climb. “Up,” in Alaska, is a relative word. There is always more “up” to discover. After only about an hour of trekking, we began drinking straight from the streams. It was plainly evident, just by looking at and smelling it, that we would never find water cleaner on the planet than what filled these small ponds, pools, and falls. We filled our water bottles straight from tiny brooks—pure, clear, clean, and as refreshing as an icy beer. There is not another taste on earth like water from a stream, and the climb up Hatcher Pass was worth it for nothing more than the experience of leaning over and cupping endless mouthfuls of it. Hours later, after bouldering through rock fields then moving farther and farther up into the thinning air, we came around a craggy patch and descended upon Reed Lake. The lake is pure glacier run-off—an iridescent, bright, sea-foam green body with small discs of ice floating on the entirety of its surface, making it seem as though there are dozens of small, white eyes looking up toward you. Dry, pointed peaks ascend from its shore, with scuttling scree falling sharply to its beautiful, rocky edge. Looking up to the left of it, we could see the dramatic waterfall that drops through the valley and deposits its water into the lake. It took more than five hours to reach the lake from the trailhead, and though the waterfall was just another 45-minute trek above us, we hesitated, well aware we still had to get down. But there are moments in life—simple moments not overly important in the larger scheme of things but important to the soul—too adventurous to pass up, too fulfilling once achieved to miss. On an adventure, one has to be aware of the call from the now. We knew we might never return to this moment, and it was here for the taking: a clear and beautiful day on an Alaskan mountain, our ability to climb and climb and climb so very strong in our bodies and our bones. We pushed on and topped the falls, looking out over the grand valleys and peaks from which we had just traversed and taking in the amazing vista—the now insignificant-looking smallness of the ice floats in Reed Lake, its electric green all but shaded by the distance up; the rock fields we had bouldered across, stony and black; the clouds and rock and sky below us, rather than above us, treading barefoot atop a sheer cliff of rushing water on top of the world. On the long trek down, we returned to the shallower glacier ponds, and it was there I got my courage up, donned my swimming suit, and jumped in for a dip. Two seconds in, two seconds out was all I could manage, but the exhilaration was worth the dare. The next day we headed out to a local hike near the small town of Eagle River, a respite from our 15-miler. Beach Lake is a mostly flat lakeside hike with no particular effort required other than a pleasant, warm-weather walk. But the ease does not detract from its beauty. The lake is still and serene—swimmable from the 10-foot-long beach on the far side—and as picturesque as a postcard. Low-lying black mountains frame the geography, and the perimeter is rich with trees and foliage. Wildflowers abound in shades of lavender, bright orange, pinks, creams, and yellows. But the real appeal is to walk the trail halfway around the lake then step through a tree-shrouded path, which opens onto a vast beach on the inlet waterways of the ocean. More mountains greet you on the other side, and the pebble-strewn beach is a stunning place to just sit and watch the world go by. Located in a well-populated state park, the Thunder Bird Falls medium-level, mile-or-so hike is special for one simple reason: The views along the cliffs are truly lovely, and by walking down a dirt slope hikers can come into the cave-like cove of the falls and stand under them. Once you’ve seen the viewpoints on the higher trail, it’s a relatively easy walk downhill to the rushing water and, should you choose to do it, a more delicate walk across the lower falls. 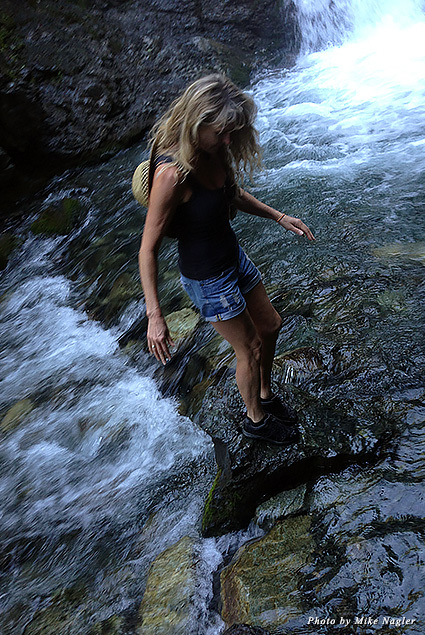 The amount of moss and slippery stuff growing on rocks under your feet make the crossing somewhat precarious, but standing inside the wave of the spray, just feet from a vigorous, cascading, 40-foot rush of water hurling towards your feet is nothing short of sweet. Rushing water has always fascinated and refreshed the human spirit, so Thunder Bird delighted us with its easy-to-walk, easy-to-please sensations. 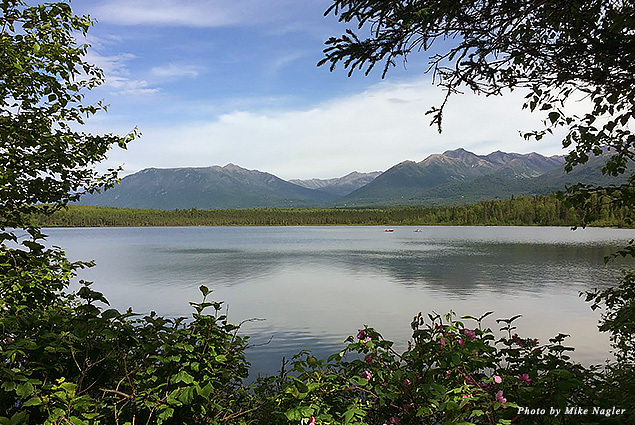 The most water-sport-friendly lake we visited, Eklutna Lake spans a wide expanse between scree-and-snow-capped mountains on one side and sharp slopes covered with growing vegetation on the other. In the summer, the greenery grows by the minute here, and it’s hard to believe the earth in Alaska is frozen most of the year. On the path in, the lavish greenery stops at the edge of a broad wet-and-dry mud field; if you bring your old swimming suit, you can lather up here just like in a Calistoga spa. The mud sits at the edge of the water and is rich with minerals from the local terrain. The day we were there it was fairly populated by Alaska terms (meaning there were about 20 people on the lake). Paddle boarders, kayakers, and swimmers moved in and out of the water, and the dogs found a heaven on earth rolling around in the mud before dog-paddling it off. 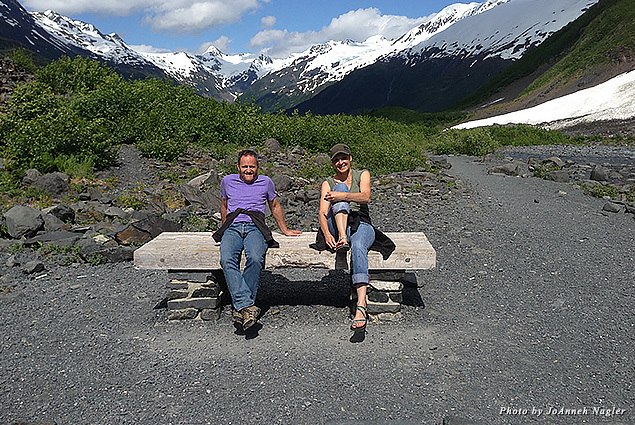 Eklutna’s road-out hotspot—the only store on the road for miles—is Rochelle’s Ice Cream stand, a totally worth it trek to find the best Alaskan wild blueberry ice cream you’ve ever had in your life. 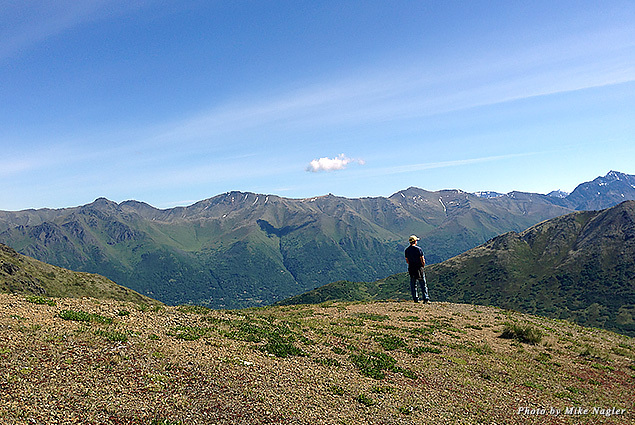 Any day is a good day in the Alaska summer, and since the sun’s not going down anytime soon, there’s plenty of time to sample the local color, long after your hiking boots have been dusted off and your day-hikes are done. The small town of Seward, just two hours south, has a lovely harbor groove with plenty of eateries and peaks that look just like the Alps pirouetting up from the broad bay. 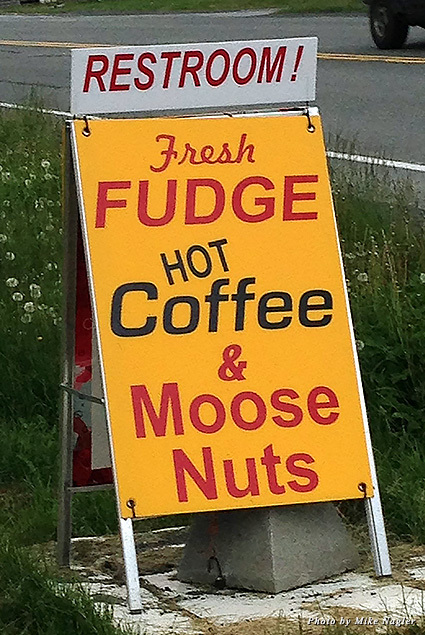 The tiny town of Talkeetna, a quaint spot with a hippie vibe is just an hour away. Both are hamlets worth seeing. Everywhere you go there are plenty of fish, oysters, clams, salmon, and halibut for the having in local restaurants and pubs. But the best of our local finds were the simplest. At the Bubbly Mermaid, a champagne and oyster bar with only about 12 wooden stools in the whole place, we ate the best oysters we’ve ever had—delicate, icy, watery, and as delicious as the cold streams themselves—pulled right out of the local bay. And then there was the fresh Copper River salmon, bought from Copper River Seafoods and plopped on a grill for a mere eight minutes. 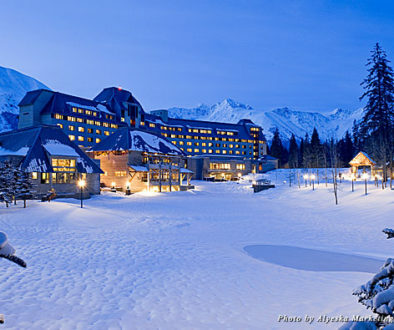 Alaska is a discoverer’s frontier paradise, a gorgeous, open wilderness of sky and sea and grace and exploration. It is an awe-inspiring summer land where the sun never sets on your adventure, and you’ll never want it to.